A forthcoming mixed-use affordable housing development by David Baker Architects (DBA), Kennerly Architecture and Planning, and CMG Landscape Architecture (all San Francisco–based firms) aims to bring 579 new units to a complicated site in San Francisco’s South of Market district. The 500,000-square-foot project—known as 1629 Market—is being master planned by the two architecture firms to take into account a series of impediments and historic properties on the site, including an immovable ventilation shaft serving a transit line running below the site. The vent will be given a sculptural treatment by the designers: a geometric exoskeleton will highlight the vent's place at the center of a new plaza. The designers are aiming to repurpose several of the site's historic structures, as well, including the Single Room Occupancy (SRO) Civic Center Hotel and a historic commercial building. The development will bring a mix of market rate and affordable homes, replace facilities for the Local 38 Plumbers Union Hall, and add a new public park to the bustling area in addition to the historic renovations. The development will ultimately come with 20,000 square feet of public open spaces that include the aforementioned central plaza as well as a series of pedestrian passageways that cut through the site. The plaza areas will be located at the heart of the site and are to be surrounded by a mix of storefronts and residential entrances. 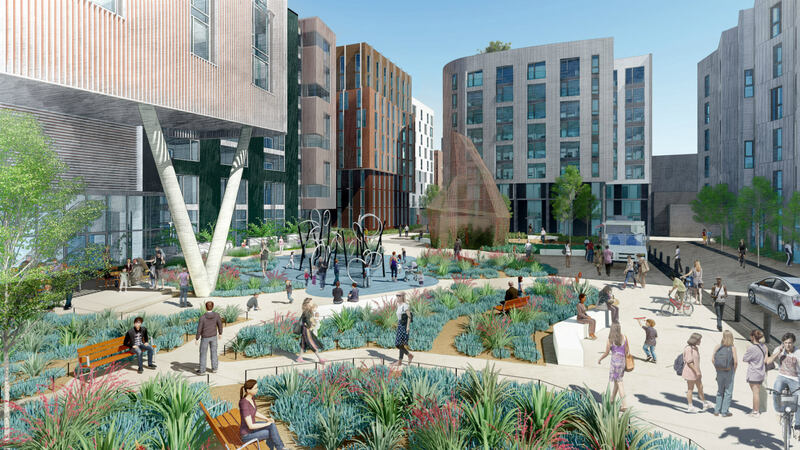 Renderings depict a terraced square populated by amorphous planters, the sculptural vent, a play structure, and other recreational components. The space is overlooked by apartments on all sides with commercial storefronts wrapping one edge of the plaza along Brady Street. The storefronts—13,000 square feet of retail uses, total—will wrap the outer edge of the entire complex along Market and 12th Streets, as well, allowing for the block’s interior streets to harbor a more residential atmosphere. These interior streets—“mid-block mews,” in the designers’ parlance—are designed as publically-accessible pedestrian paths accessible to unit entrances and shared residential amenities. Renderings for these spaces depict broad, tree-lined walkways overlooked by apartment windows. DBA Principal-in-Charge Daniel Simons told The Architect’s Newspaper that a major design consideration for the ground floor walkways was to embed multiple uses among the various routes, an arrangement that will allow for constant and diverse occupation. The project will relocate 100 affordable units from the existing SRO into a new building being developed as a part of the project. The so-called 53 Colton housing block will be managed by Community Housing Partnership and is being designed by DBA. The building will flank the southern edge of the plaza and will feature metal panel cladding, punched openings, and a zig-zagging facade. 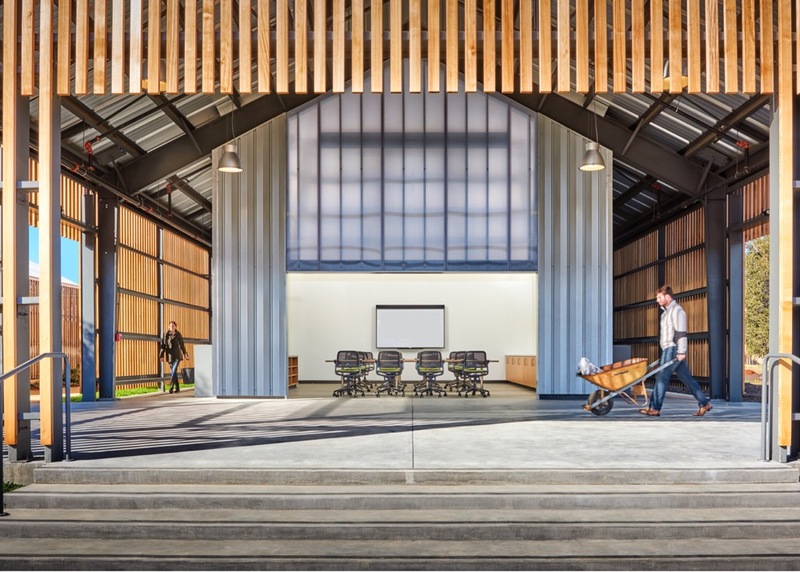 DBA’s other buildings on the site also feature similar contemporary massing and will come clad in fiber cement board, plaster, and extruded metal rainscreens, among other treatments. Kennerly is responsible for the design of the so-called Brady 1 building, a 188-unit structure opposite 53 Colton that will incorporate and expand a historic, single-story commercial structure fronting Market Street. The Brady 1 structure, according to renderings, features alternating protrusions wrapped in vertical louvres along Market while also wrapping the corner to flank the Brady plaza within the site. A portion of this structure features rounded corners and is raised above the plaza on a large scale Y-column. The project is currently undergoing design review and is expected to complete the entitlement process this fall. 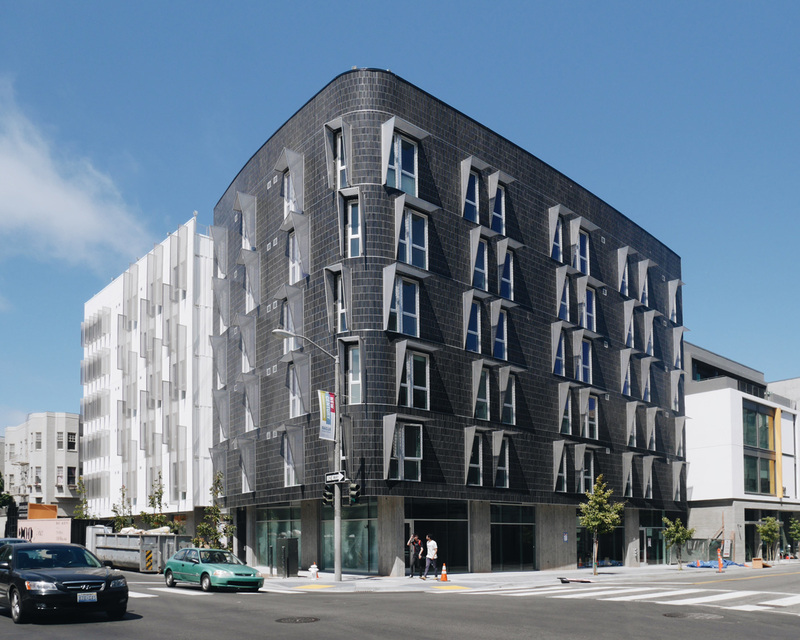 The Pacific Pointe development, designed by David Baker Architects (DBA) with Interstice Architects as associate and landscape architects, is the first 100-percent-affordable housing development in the new Hunters View area of San Francisco. 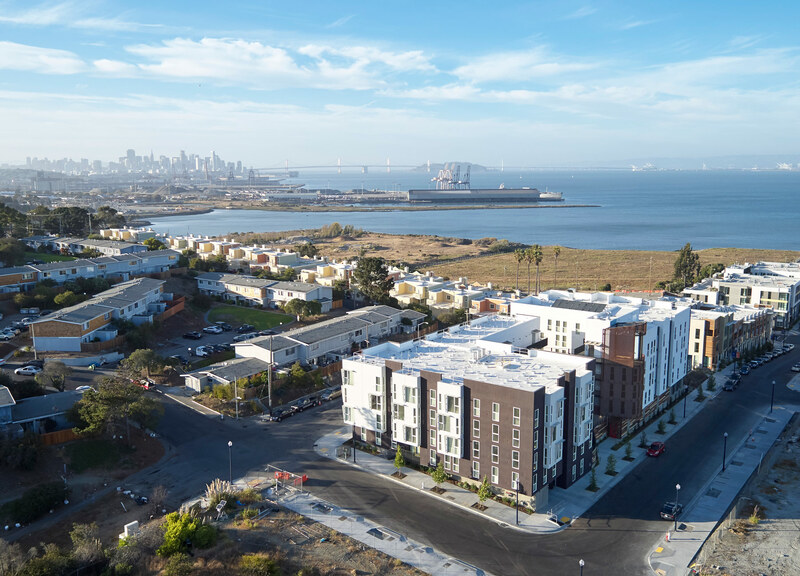 The development is among the first completed projects in the new 420-acre neighborhood, a former naval shipyard that was—until recently—one of the most polluted sites in the country. After 20 years of remediation work, the enclave at the southern tip of San Francisco is now slated to receive upward of 10,000 new housing units as well as a slew of recreational and commercial programs. The 60-unit apartment complex—developed by AMCAL Multi-Housing and Young Community Developers—is located near the center of the new environ, at the corner of Friedell Street and La Salle Avenue. The complex is organized as two interlocking L-shaped wings bridged by a two-level courtyard. The building features units ranging from one- to three-bedrooms supplemented by ground-level assembly and amenity spaces. The five-story complex is punctuated along Friedell Street by a perforated Cor-ten steel panel–clad circulation tower that connects to a monumental stairway running through the principal courtyard. That stairway jogs across the elevated portion of the courtyard and eventually empties out onto a generous seating area with custom benches and native plantings. That elevated portion conceals play areas, building programming, and parking below, while stretching deep into the site where it is overlooked from multiple vantages by single-loaded corridors leading to unit entrances. The courtyards are articulated by generous planters framed by Cor-ten steel panels that are interrupted by jagged, stepped benches and wood platforms. Andrew Dunbar, principal at Interstice Architects said, “A fresh-air entry court is located at the lower level; above the parking, we were able to create a park-like courtyard that creates an intimate interconnecting ‘front yard’ for all the inhabitants.” The seating areas contain an unusual element: Raw 10-foot-long logs are embedded directly into the seating and stage areas. “We liked the surrealist effect of the logs as floating elements in the sea of wooden water—they speak to driftwood and offer imaginative play opportunities that recall the logging industry that once used the bay,” Dunbar explained. The remainder of the complex is organized as a series of simple apartment blocks with several alternating sections of massing projecting beyond the main bulk of the complex. These overhanging areas create coverings for doorway stoops in certain areas and provide simple shade over windows in others. Along the stoops, the scale of the building breaks down to include more raised Cor-ten steel panel planters, modestly planted green areas, and broad stair landings designed for children to play on. In most areas, the units are studded with flush-mounted floor-to-ceiling casement windows articulated to look double-hung. Window assemblies containing large picture windows are wrapped by planar shading devices that demarcate certain aspects of the program—namely the living areas. As is customary in much of DBA’s recent work, these shared ground-floor areas are detailed with smooth, cast-in-place concrete. The articulated portions of the building containing housing programs are variously clad in smooth, painted stucco, or horizontal siding. 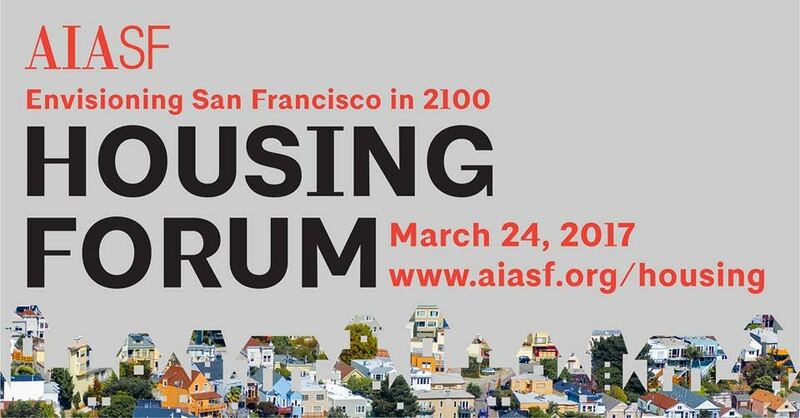 For more information on the event, see the AIASF website. 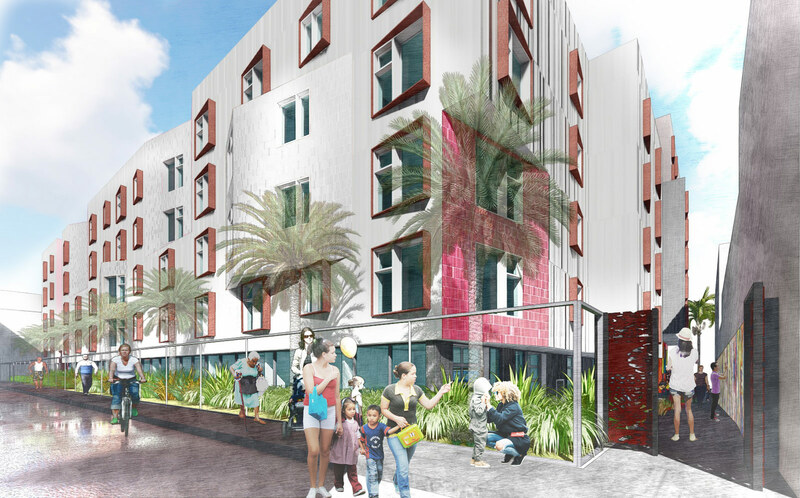 San Francisco–based David Baker Architects, along with affordable housing developers BRIDGE Housing Corporation and Mission Housing Development Corporation, have released conceptual renderings for an upcoming, 100-percent affordable housing complex in San Francisco. The project, 1950 Mission, is to be developed in the Mission District neighborhood of the city and will provide 157 affordable units to the area, with 20 percent of those units set aside for formerly homeless families and the remaining homes allotted for families making between 45 and 60 percent of the area median income. According to city-data.com, the average median income for the Mission District in 2013 was $73,718. The 1950 Mission complex is designed as a pair of apartment blocks connected by a central courtyard with a large, nine-story building fronting Mission Street and a smaller, five-story structure located along a mid-block alleyway. The primary structure on Mission Street features a variously articulated facade arrangement that is segmented into three sections with a central stepped black-panel-clad portion flanked on either side by street-fronting apartment blocks. These facades, similarly clad in panelized finishes along the lower four floors with stucco walls above, feature storefront windows along the ground floor and punched openings denoting the apartment units above. The storefronts include smaller-than-average retail spaces designed to be occupied by local businesses, with plans to include an art gallery as well. The commercial areas along the ground floor will also feature varying ceiling heights, between 11 and 20 feet, in an arrangement that will help to boost the overall number of units developed through the project. The areas along the ground floor are set back from the building mass in certain areas, allowing the units above to create covered outdoor space underneath by acting as shade-casting overhangs. The smaller apartment block will be accessed via a mid-block public approach that also connects to the central courtyard space and will feature an “artists’ paseo,” a walkway flanked with artists’ studios. With this arrangement, the designers hope to create a community gathering spot and arts-focused public space. The second apartment structure is set back from the alley with a 10-foot-wide planted area and features masonry-clad, undulating facades with specialized window hoods covering most of the building’s punched apertures. Those hoods are articulated to shield the openings from solar glare, and dot the stepped facade along various exposures. The building is topped by a rooftop garden and urban agriculture facility the architects have dubbed “Jardin de Las Familias,” and is connected to the larger structure via a series of stacked skywalks that traverse the courtyard area. The project will provide on-site supportive services for future tenants via providers PODER, Mission Neighborhood Centers’ Head Start and Early-Head Start, Lutheran Social Services, and Mission Girls Services mentorship programs. Cervantes Design Associates will serve as associate architect on the project, which is currently moving through the entitlement process. A timeline for construction has not yet been released. A new market-rate micro-housing project in San Francisco's Hayes Valley—developed in tandem with a new clubhouse for the Boys and Girls Club—features 70 studio and two-bedroom apartments clustered around a courtyard with ample, secure bicycle parking. The wood-framed housing structure sits atop a concrete podium housing retail spaces just off the main Hayes Street corridor. The new construction project continues development of vacated land caused by the collapse and removal of the Central Freeway. The project—designed by David Baker Architects, which has designed and built more than 10,000 dwelling units—achieves a density of 240 bedrooms per acre, and consists of 40-percent two-bedroom units located at each corner and facing the courtyard. This is the result of a policy by the city to allow new residential developments to accommodate families. The other apartments are classified as micro-units, ranging from 325 to 400-square-feet. These compact studio apartments embrace an "affordability by design" concept, which, according to David Baker Architects, has “proven popular with younger professionals, as well as seniors.” One of the most contentious issues of the project was a large corner bay clad in a custom glazed tile. The bay's massing spans the entire end of the building, out of scale when compared with a typical vernacular bay, however, the architects say this feature is rooted in careful planning and urbanistic principles. The positive and negative forms of 388 Fulton and the Richardson Apartments across the street—another project by David Baker Architects—make a frame for the City Hall dome two blocks away. The black coloration was produced from custom low fire glazed tile sourced from local clay. An artisan tile company glazed the brick with a palette of five subtle variations on a standard “Inkwell” black color. The architects specified a repeating pattern for the colors, which Baker said sometimes gets mistaken for being a uniform color. "The different tile colors added a richness to the composition, which one color would not have provided." The thin tile was set directly onto a mortar bed over a cement plastered wood-framed wall. Expansion joints coordinate with punched window openings for a clean composition. The stacked bond tile also integrates precisely with vents on the facade, which required careful coordination between the contractor and architect. The windows in the curved mega-bay have a custom extra-deep extrusion to accommodate the thickness of the glazed tiles. Computer analysis from programs like Autodesk Ecotect was used to optimize perforated aluminum sunshades on the curved facade and west-facing windows. Design criteria included the relative amount of solar radiation that would hit each window for different times of the day and year, including shade from the building, neighboring buildings, and sunshades. After several iterations, the design resulted in a combination louver-and-fin for windows along the curved bay, and a vertical fin of varying length along the west-facing facade. The shapes of these elements were standardized into three repeatable configurations for fabrication efficiency while minimizing solar radiation during the afternoons in late spring and early fall, particularly into studio units with challenging western exposure. Baker said the project team integrated a lot of fun detailing into the project: “The large curved bay is the signature of the building, and something we put a lot of energy into. We took fairly humble materials, and made them look crisp and sleek." A trademark example of this design approach is the “random batten system,” a phrase coined by the office for an aesthetically driven approach to installation of fiber-cement trim board. Baker called this "ranch house technology." The assembly calls for standard fiber cement board trim to be applied in a randomized pattern, transforming a ubiquitous board and batten system into what Baker said, "Looks like something that you would order from Italy." 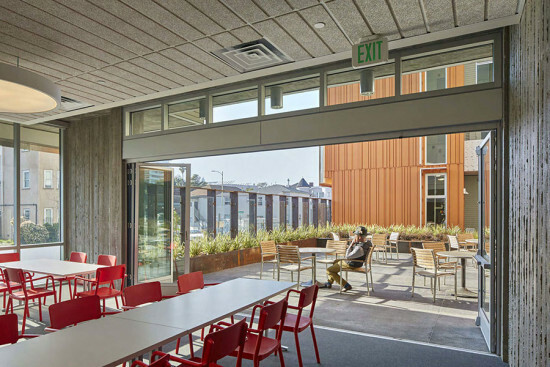 Having built over 10,000 units in the San Francisco Bay Area—6,000 of which have been affordable housing—David Baker Architects is a leader in navigating the complex public-private partnerships necessary to build affordable housing today. 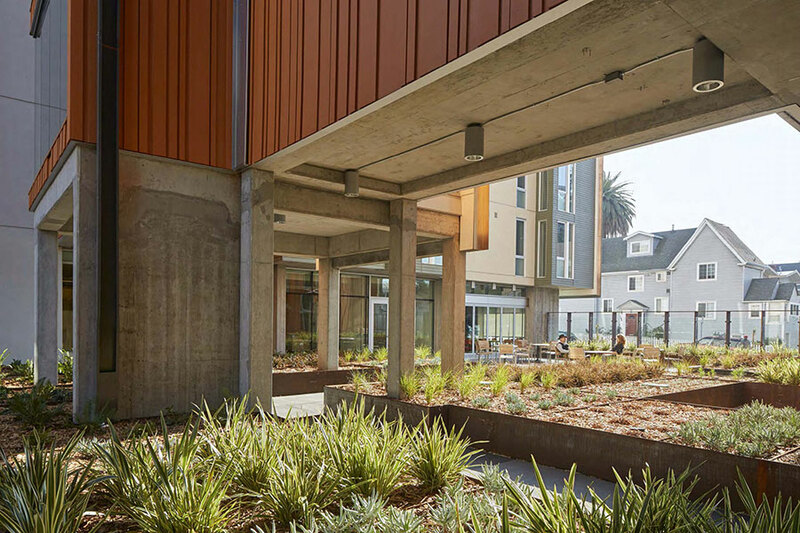 The San Francisco firm, founded in 1982, recently completed work on Lakeside Senior Apartments, a compact, 91-unit, .66-acre complex located on the edge of Oakland’s Chinatown neighborhood. 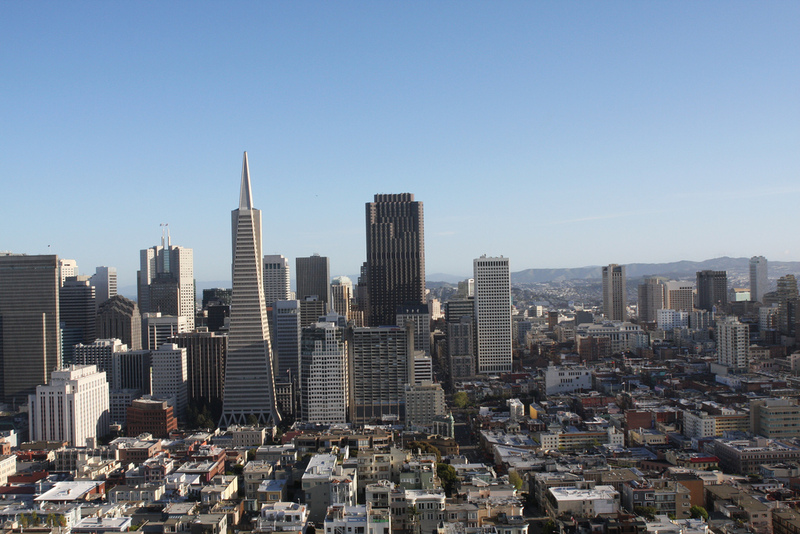 The project adds an additional 91 domiciles to the nearly 757 affordable units built in the region in 2014, as reported by San Francisco’s Planning Department. Designed to maintain neighbors’ vistas of the surrounding landscapes, Lakeside was constructed to house very-low-income and special-needs seniors and includes 32 units set aside to house formerly homeless seniors. Residents must be at least 55 years of age to live in the apartments and have a household annual income no higher than 50 percent of the area median income. The housing complex, located at the corner of East 15th Street and 2nd Avenue, is organized as a grouping of two parallel masses that frame a central courtyard. The street-facing courtyard opens toward the west and is bisected by a slender perpendicular bridge that cuts across the L-shaped site, connecting the two apartment blocks. The courtyard spaces are organized as a rectilinear tapestry of grasses, Cor-ten steel, and concrete flooring, where residents can exercise and socialize. Ground-level community programs take place within a mostly unadorned board-formed concrete plinth, with overhanging housing above. The buildings’ articulated facades are clad in perforated metal panels and stucco, as well as vertical and horizontal louvers along east and west exposures. Deeply recessed balconies overlook both street-side and interior spaces, while ground-level residences along 2nd Avenue open directly onto the street with porches. The building’s ample lobbies feature spare, exposed concrete walls and light-colored wood paneling, and the buildings’ extra-wide corridors are equipped with handrails. Laundry rooms are located on each floor, surrounded by seating areas that open into the public spaces, while the aforementioned courtyard bridge features sunny lounges where residents can rest, gather, and socialize outside of their units. With sweeping vistas of nearby Lake Merritt, each volume’s fifth floor includes a gamut of wellness-focused rooftop community spaces, including a shared garden and a community room with kitchen. “The community garden is beautiful and actually very productive. The complex has really great breakout spaces—the courtyards and community rooms—where people can pause. That’s especially important for seniors,” principal David Baker said.